How much money should you save each month? The simple answer is, as much as you can. Everyone makes a different amount each month. They also have different monthly financial obligations. It is important to realize that one dollar amount is not going to work for everyone. Here are some basic guidelines you should follow when determining how much you should save each month. The standard that many experts set is at least 10 percent of your income. This is a good starting point. It is an easy way to start because it is a set amount of money each month. 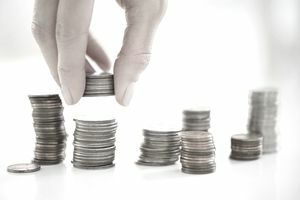 It should not be that difficult to save 10 percent of your income, but you may want to increase this amount over time. Eventually, you can work up to 20 or even 30 percent to increase your savings and plan for your future. It is important that you are saving in addition to the money you are putting in your retirement savings account. If you do not, you will never save up money for an emergency fund or for a down payment on your home. Additionally, if you want to retire early, you will need to have savings that you can live on that is separate from your retirement accounts, which you cannot begin accessing without a penalty until you are 59½ years old. It is important that you make saving a priority for both retirement and other goals. Another common way to measure whether or not you are saving enough money is to check to see if you are saving until it hurts. If you feel like things are just a little bit tight, then you are saving a good amount. You may want to lighten up enough that you have breathing room in your budget, but tight enough that you still have to watch what you are spending each month. This does not mean that you never have fun or splurge, but you should be saving enough so that you are not splurging every single day. You may also want to work on increasing the amount you save each month. It is not unreasonable to begin saving 20 percent of your income or even more each month. If you make a significant amount more than you need to live on each month, then you really should save a lot of money. One easy way to increase the amount you save is to save more as you get a raise. This way you will not feel it as much. Also, give yourself challenges each month to make sure that you are setting your spending categories as low as you comfortably can. It is also important to remember to give. Once you begin saving your money, you should give it a purpose. For example, you should have three to six months of living expenses set aside in an emergency fund. Then you may set aside a portion to save for retirement. Many experts say that you should strive for 15 percent each month for retirement alone. Then you may set aside money for a vacation or a new home. After that, you may have some that you save just to build your wealth. If you know what you are saving for, it is easier to make the sacrifices that you need to get there. As you begin to look at the ways that you can save money, and get out of debt, you will be surprised at the power that your money has. It will also begin to grow very quickly if you are diligent in saving each month. You can use strategies to help you save in your 20s. The earlier you can build good financial habits, the better off you will be. Saving money consistently is an important financial habit to establish now. If you make saving automatic, it can be even easier to save money each month. This allows you to save without spending time each month focused on it. Setting up an automatic transfer is the easiest way to do this.